To begin, I tested out the HTC Vive in a room with no obstacles (well, not in the designated area. There was a fan if I reached my hand up too high and jumped that I would have hit, but I’m really short and the VR adapted to that). 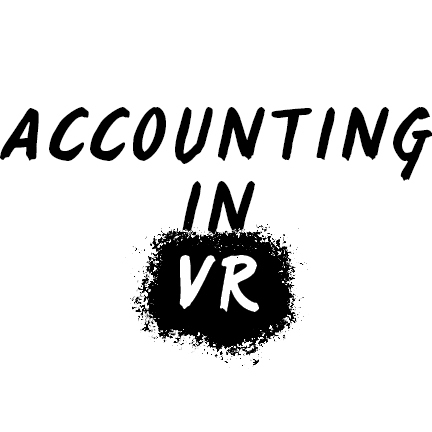 The game/app I started up was called Accounting (found on Steam) by Crows Crows Crows and Squanchtendo. My initial reactions were about the setup and environment of the game. As a fan of Rick and Morty, seeing the similar animations and character designs were really neat. And what really pulled the experience was the voice acting. While it was mostly done by one person, it still felt really fun and interactive. The controls were easy to use and instead of utilizing all the Vive’s controls it stayed rather simple for a more “fun” experience for everyone (though the game isn’t for everyone because of the language and gore). The only controls I had to use were triggers on the remote. My hands had a shadow cast in the real world, which I thought was a nice added touch, however, my hands were computer cursors rather than actual hands. Adding to the fun and cartoon feel of the game. You start out at your new desk in an accounting firm, and the objective is to find a VR headset and a cartridge so you can go through the “training” for your new job. However, you put in the wrong cartridge and get sent into a different VR experience than expected (though that’s what is supposed to happen). As a side note, I’m typing this up on my computer and going from the Vive to my computer has my vision all wonky and I keep having to look around and make sure this is the reality even though the graphics in the game weren’t close to reality at all. It’s a surreal feeling. Back to describing the experience! I think the weirdest part for me was at one point you end up in a courtroom behind a table and before a judge. While I was listening to the guy ramble off what I had done, I felt the strong urge to lean forward onto the desk, except there was nothing there so I would have fallen. Overall I’d recommend playing the game (just don’t do it around kids because of the cartoon gore and very constant swearing). It is a fun and short experience that can really introduce one into VR and storytelling in a condensed manner. While there’s not a lot of choices you can do in the game, it was fun to pick up things like staplers and move them around my desk while I listened to my coworkers help me figure out where things were. And the best part about it is that it’s FREE! Sounds like a neat game, and something definitely worth checking out!